Chronic aortic regurgitation (AR) is a condition in which patients remain asymptomatic with preserved left ventricular ejection fraction (LVEF) for a long time due to the adaptation of the left ventricle (LV) to a combined volume and pressure overload. Without surgical correction, in time, this chronic overload induces LV enlargement and systolic dysfunction and progressive symptoms of heart failure and even sudden death 1. The onset of symptoms is a definite indication for correction in patients with severe AR, but optimal timing for surgery in asymptomatic patients is still a matter of debate as aortic valve replacement (AVR) is the most frequent choice of treatment and AR patients are often younger than patients requiring AVR for aortic stenosis. On the other hand, when surgery is delayed, irreversible myocardial structure damage and dysfunction occur and complete LV functional recovery after AVR is difficult 2-4. Frequently, the occurrence of LV dysfunction precedes symptoms onset, thus detection of subclinical LV dysfunction is essential for the further management of asymptomatic AR patients. Current European Guidelines recommend surgery in asymptomatic patients with severe AR considering LVEF and LV diameters as parameters of LV systolic function and overload5. However, the degree of LV systolic dysfunction (LVEF <50%) and dilation (LV end-diastolic diameter >70 mm or LV end-systolic diameter >50 mm or LV end-systolic diameter indexed to body surface area >25 mm/m 2) mentioned by the guidelines may occur in advanced stages of the disease. Moreover, volume-derived measures of LV function such as LVEF depend on loading conditions and thus do not properly detect myocardial contractility impairment. Therefore, more sensitive parameters able to detect subtle changes in LV function before irreversible damage occurs are of real clinical value 6,7. Several studies recently identified newer echocardiographic parameters of LV systolic function: longitudinal myocardial velocities by tissue Doppler imaging (TDI)8, deformation parameters (strain/strain-rate) by TDI9, speckle-tracking echocardiography (STE)6,10-12 or velocity vector imaging13. Moreover, some studies assessed the prognostic value of these parameters in conservative management or postoperatively in AR patients6,7,14. On the other hand, data regarding the parameters of LV torsional dynamics (LV rotation, LV twisting and untwisting motion) as key components of an efficient systolic performance 15 and diastolic filling in severe AR are scarce. We hypothesized that, in patients with hemodynamically significant chronic AR and normal LVEF, newer parameters of LV systolic function are impaired and this impairment further progresses even during short-term follow-up. Thus we aimed to assess parameters of LV mechanics using STE and their dynamic behavior during follow-up in asymptomatic patients with significant chronic AR. Study population was selected from patients referred to our echocardiography laboratories (Euroecolab, “Carol Davila” University of Medicine and Pharmacy, Bucharest and Echocardiography Lab, S. Maria degli AngeliHospital, Pordenone) for assessment of aortic valve dis ease. Inclusion criteria were moderate-to-severe and severe chronic AR, adult age (>18 years), asymptomatic status, normal LV ejection fraction (LVEF) defined as resting LVEF >50%5. The AR severity was established according to the European Association of Cardiovascular Imaging recommendations16 using a combination of quantitative parameters (a regurgitant volume >45 ml by PISA method) when feasible, or semi-quantitative (vena contracta width >6 mm) and qualitative (holodiastolic flow reversal in the descending aorta with an end-diastolic velocity >20 cm/s) parameters. Exclusion criteria included an inadequate acoustic window, the absence of sinus rhythm, documented coronary artery disease (history of acute coronary syndrome or previous revascularization procedures, coronary stenoses ≥50% at coronary angiography when available), segmental LV wall motion abnormalities, cardiomyopathies, more than mild associated valve heart disease, valvular prostheses. The recruitment of patients occurred prospectively from October 2010 to November 2013 and 50 patients were selected according to the abovementioned criteria. A baseline echocardiographic examination was performed in all AR patients. Follow-up echocardiograms were performed at every 6 months in all patients who agreed to continue the follow-up in our centers. We also enrolled a control group of 50 healthy subjects with similar age and gender distribution and without known heart disease or signs of heart disease at physical examination and normal electrocardiogram (ECG) and echocardiography. All study subjects gave their written informed consent to participate in the study. At baseline and during follow-up, two-dimensional (2D), conventional Doppler echocardiography and speckle-tracking echocardiography (STE) was performed in all study subjects using commercially available cardiac ultrasound machines (Vivid 7 Dimension and Vivid E9, GE Healthcare, Horten, Norway). Offline analysis of all echocardiographic examinations was performed by a single observer using the same version of a dedicated software (EchoPAC PC version 12.1.1, GE Healthcare). For all measurements, the average of 3 heart cycles was used. Biplane Simpson’s method was used to calculate LV volumes and LVEF. LV mass was estimated by the Devereux method 17 and indexed to body surface area (BSA). Linear LV dimensions were measured and endocardial LV fractional shortening (LVFS) was calculated according to the American Society of Echocardiography/European Association of Echocardiography recommendations18. Also, LV relative wall thickness (RWT) was calculated as 2 x PWT/ LVEDD, where PWT is the LV posterior wall thickness at end diastole and LVEDD is the LV end-diastolic diameter. In order to evaluate the LV chamber shape we used a sphericity index (SI) calculated as the ratio between the LV end-diastolic volume (LVEDV) and the volume of a sphere whose diameter was equal to the end-diastolic LV longitudinal diameter in apical 4-chamber view (Figure 1)19. Pulse-wave Doppler was used to assess mitral diastolic flow. Peak systolic (S) and peak early diastolic (e’) mitral annular velocities at septal site were obtained by pulse-wave tissue Doppler imaging (TDI) from the apical 4-chamber view. The ratio of peak early-diastolic mitral flow velocity E to e’20 was calculated in order to estimate LV filling pressures. Left atrial (LA) volume was measured from the apical 4-chamber view using the area–length method. Analysis of LV strain by STE was performed on the 4-chamber, 2-chamber and long-axis apical views. For each view, 2 basal and 1 apical anchor points were manually marked and the endocardial contour was automatically tracked, generating a region of interest divided into 6 segments. Global longitudinal strain (GLS) was assessed as the average of 17 segmental values 21. For rotation and torsion analysis, 2D images of three consecutive beats were acquired during end-expiratory breath-hold at a frame rate of 50-90 frames/s from two LV short-axis planes at the basal (at the tips of the mitral valve leaflets) and apical levels. For the apical plane, the transducer position was modified to obtain a circular short-axis view of LV apex, as previously described 22. Software-generated tracking, if acceptable, was manually approved. Averaged apical and basal rotation parameters were measured and then used for calcula-tion of LV twist and torsion. Figure 1. LV sphericity index calculated by dividing the LV end-diastolic volume by the volume of a sphere whose diameter was equal to the enddiastolic LV longitudinal diameter. LV, left ventricle. LV twist was calculated as the absolute apex-to-base difference in LV rotation. LV torsion was defined as LV twist normalized to end-diastolic LV longitudinal length measured in the apical 4-chamber view. LV untwisting was assessed by measuring peak LV untwisting velocity on the torsional velocity curve. The LV rotational parameters measured were: peak basal and apical LV rotation, peak LV twist and torsion, peak LV torsional velocity, peak apical and basal diastolic rotation rates, peak LV untwisting velocity. Time intervals to each of the above-mentioned parameters were normalized to the duration of systole and diastole, respectively. Continuous data are expressed as mean ± SD and categorical variables as percentages. Differences in measurements between groups and during follow-up were assessed using Student’s t test (independent-samples t test for comparisons between study groups at baseline and paired-samples t test for comparisons be tween baseline and the end of follow-up) for continuous variables and chi-square test for categorical variables. Associations between variables were assessed by linear regression. Standardized coefficients are reported. A 2-tailed p value <0.05 was considered statistically significant. Statistical analysis was performed using SPSS version 22.0 (SPSS, Inc., Chicago, IL).Measurement variability was assessed for LV torsional parameters in a randomly selected subgroup of 10 AR patients. The recorded images used for the second set of measurements were also randomly chosen. For intraobserver variability, the second set of measurements was performed by the same observer, one month apart. For interobserver variability, measurements were performed by a second observer on previously acquired images. Variability was calculated as the absolute differences between two measurements divided by the mean of the two measurements. As per study design, there was no significant difference between patients with AR and healthy controls in terms of age (46 ± 16 vs 45 ± 14 years, p = 0.56) and gender (41 vs 39 males, p = 0.80). The most common AR etiology was bicuspid aortic valve (58%), followed by idiopathic dilatation of the aortic root or ascending aorta (22%). Other causes of AR were less frequent in our study population (Table 1). Also, according to the study design, all AR patients were asymptomatic. Patients with AR had significantly higher LV diameters and volumes when compared with healthy subjects (Table 2) and they displayed a more spherical LV shape than healthy controls (LV sphericity index of 0.38 ± 0.08 vs 0.33 ± 0.07, p = 0.001). Also, as expected, LV mass was higher in AR patients (152 ± 39 g/m2 vs 91 ± 15 g/m2, p <0.001). Conversely, RWT was similar in both study groups. According to the inclusion criteria, AR patients had a normal LVEF. Moreover, in our study, both groups, AR patients and healthy subjects, had similar LVEF (60 ± 4% vs 61 ± 3%, p = 0.12). Also, tissue Doppler imaging (TDI)-derived peak systolic velocity at septal site (S), a parameter of LV longitudinal myocardial function, was similar in both groups (7.6 ± 1.2 cm/s vs 8.0 ± 1.3 cm/s, p = 0.12). Instead, LV fractional shortening (LVFS), another parameter of global LV systolic function, was significantly lower in AR patients (Table 2). Conventional and TDI-derived parameters of LV diastolic function were impaired in AR patients (Table 2). Also, E/e’ ratio, used to estimate LV filling pressures, was higher in the AR group (8.9 ± 3.5 vs 7.6 ± 1.7, p = 0.019). Left ventricular GLS, a parameter of global LV contractility, was significantly lower in AR patients compared to healthy subjects (-17.7 ± 2.6% vs -19.8 ± 2.2%, p <0.001). Moreover, at baseline, parameters of LV torsional dynamics were impaired in AR patients when compared to the control group. Left ventricular apical rotation, LV twist, and torsion parameters were reduced in AR patients (Table 3). Peak LV systolic torsion was decreased (2.0 ± 0.7 °/cm vs 3.0 ± 0.9 °/cm, p <0.001) and also delayed (time to peak LV twist: 0.95 ± 0.10 vs 0.99 ± 0.09, p = 0.02) in AR patients. Peak LV apical diastolic rotation rate and peak LV untwisting velocity were significantly lower in AR patients (Table 3). volume indexed to BSA; RWT, relative wall thickness; LVFS, left ventricular fractional shortening; LVEF, left ventricular ejection fraction; EDT, E-wave deceleration time; LAVi, left atrial volume indexed to BSA. during which all patients remained asymptomatic and only one patient reached a severe LV dilation requiring surgery. In addition, 2 patients underwent surgery due to ascending aorta aneurysm (>55 mm). At the end of follow-up, AR patients had higher LV volumes (LV end-systolic volume 33.0 ± 9.8 ml/m2 vs 29.6 ± 7.8 ml/m2, p=0.007, LV end-diastolic volume 82.5 ± 20.5 ml/m2 vs 74.6 ± 17.9 ml/m2, p=0.004) but similar LV mass, sphericity index and RWT. Among parameters of systolic LV function, LVEF, LVFS and TDI-derived S wave velocity at septal site did not significantly decreased during follow-up (Table 4). Conversely, the parameters of diastolic LV function seemed to be more frequently impaired during follow-up in AR patients, with a reduction in E and septal e’ velocities (Table 4). When analyzing the changes in LV mechanics, we found that, despite similar LVEF at the end of follow-up (60 ± 3% vs 60 ± 4%, p = 0.72), there was a significant reduction in LV GLS (-16.9 ± 2.3% vs -18.1 ± 2.5%, p=0.012) during follow-up (Table 5). Among parameters of LV torsional motion, peak LV apical rotation and peak LV torsion also decreased during follow-up without reaching a statistical significance (Table 5), while peak LV untwisting velocity tended to significantly decrease (-106.7 ± 49.9°/s vs -128.3 ± 39.7°/s, p=0.05). As LV GLS emerged as the parameter of LV global systolic function with the most significant impairment during follow-up in the AR patients group, correlations between end of follow-up LV GLS and baseline echocardiographic parameters of LV geometry and function were assessed. Baseline LV sphericity index (r = 0.46, p = 0.02), peak LV apical rotation (r = -0.67, p <0.001), peak LV torsion (r = -0.59, p = 0.002), LVEF (r = 0.67, p < 0.001) and LV GLS (r = 0.67, p <0.001) significantly correlated with end of follow-up LV GLS (Figure 2). At multivariable analysis, in a model including baseline peak LV apical rotation, LVEF and LV GLS, the baseline parameters that emerged as independent determinants of end of follow-up LV GLS were peak LV apical rotation (β = – 0.41, p = 0.024) and LV GLS (β = 0.40, p = 0.031). AR, aortic regurgitation; LV GLS, left ventricular global longitudinal strain; LV, left ventricle. Interobserver variability values for the LV torsional parameters were: 0.5 ± 7.2% for peak LV apical rotation; 6.7 ± 19.4% for peak LV twist; 3.6 ± 20.0% for peak LV torsion; 5.2 ± 23.0% for peak LV apical diastolic rotation rate; and 5.1 ± 29.4% for peak LV untwisting velocity. Intraobserver variability for the same parameters was 0.3 ± 3.8%, 7.0 ± 15.6%, 5.6 ± 15.4%, 0.9 ± 8.0, and 5.6 ± 11.2%, respectively. In the present study, we aimed to describe the systolic and diastolic LV mechanics in terms of longitudinal deformation and rotational and torsional motion assessed by 2D-STE in chronic AR with normal LVEF and dynamic changes of these parameters during short-term follow-up. Our main results are that both longitudinal deformation measures expressed by LV GLS and parameters of LV rotation/torsion are impaired even in asymptomatic patients with hemodynamically significant AR and normal LVEF. Left ventricular GLS is lower, peak LV apical systolic rotation and diastolic rotation rate, peak LV twist and torsion and peak LV untwisting velocity are all reduced, and peak LV twist is also delayed in these patients. During short-term follow-up of these AR patients, despite maintaining the asymptomatic status and a normal LVEF, LV GLS, as parameter of global LV contractility, decreased significantly, compared to baseline, along with conventional (E and e’ velocities) and newer (LV untwisting velocity) parameters of LV diastolic function. 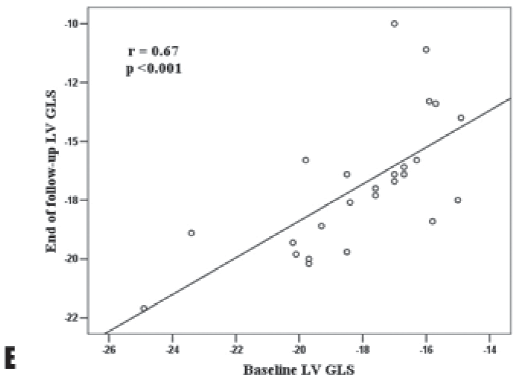 Baseline values of LV GLS and peak LV apical rotation emerged as independent parameters of end of follow-up LV GLS. Chronic AR has usually a slow rate of progression that leads to LV adaptation to the combined volume and pressure overload by eccentric hypertrophy. The forward ouput is maintained by increasing preload. In the compensated phase of severe AR, the LV elastance, expressed as the slope of the LV pressure-volume relationship assessed invasively and a load-independent parameter of myocardial function, is normal. As severe AR progresses, due to LV dilation and development of systolic hypertension, there is an increase in systolic wall stress and LV elastance decreases, indicating subclinical myocardial dysfunction as LVEF is preserved due to increased preload. If AR progresses further, myocardial fibrosis increases, LV compliance decreases, LV end-diastolic pressure rises. Consequently, the mechanism of hypertrophy becomes maladaptive with further increase in systolic wall stress. This afterload mismatch combined with a limited preload results in impaired LVEF 23-25. In the early phases of severe chronic AR, the LV dilation associated with increased LV wall stress induces a subclinical impairment in LV function that starts in the subendocardium, where the longitudinal myocardial fibers have a longitudinal orientation. Figure 2. 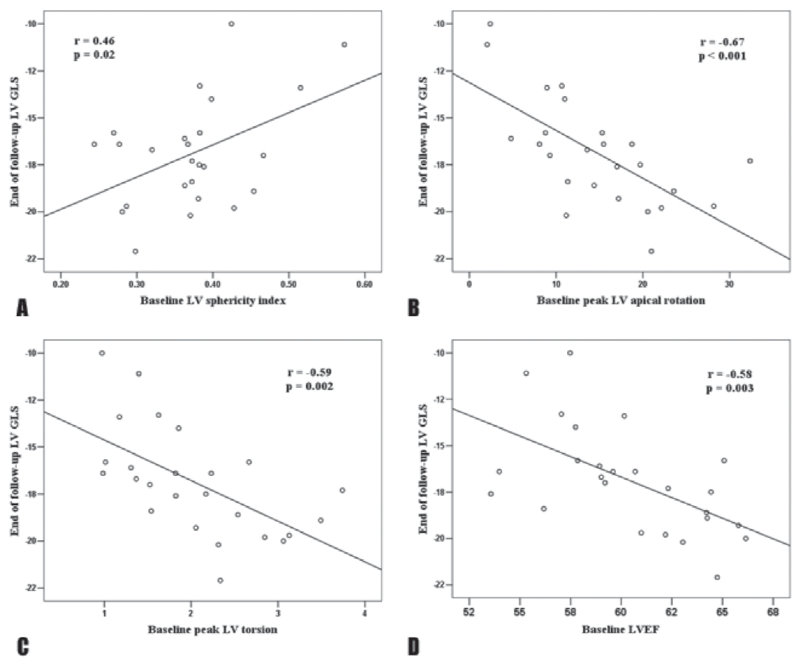 Correlations of end of follow-up LV GLS with baseline parameters of LV geometry and function: LV sphericity index (A), peak LV apical rotation (B) peak LV torsion (C), LVEF (D) and baseline LV GLS (E). LV, left ventricle; LV GLS, left ventricular global longitudinal strain. Consequently, assessment of longitudinal LV function by GLS seems to be a sensitive parameter for detecting early LV dysfunction due to afterload mismatch in patients with AR, with the advantage of being noninvasive in con-trast to LV elastance. Several studies reported impairment of myocardial deformation parameters (assessed by TDI or STE) in asymptomatic patients with chronic moderate and severe AR with preserved LVEF 9,26, results similar to those from the our study with significantly lower LV GLS in AR patients at baseline.Moreover, myocardial deformation parameters show ed significant prognostic value in different studies in AR patients. Olsen et al. demonstrated that reduced LV GLS was associated with disease progression or impaired outcomes after surgery in patients with moderate-to-severe AR6. Results from other studies showed that LV GLS, assessed by velocity vector imaging or STE, was independently associated with the need for AVR in asymptomatic patients with moderate-to-severe and severe AR13,14. In our study, LV GLS, already impaired at baseline, compared to healthy controls, decreased further during follow-up, despite non-significant change in LVEF or LV geometry, suggesting an ntrinsic progression of subendocardial dysfunction. Due to short-term follow-up (an average of 15 months) during which all patients remained asymptomatic and only one of them required surgery due to severe LV dilation, the prognostic value of an impaired LV GLS could not be assessed. In the LV myocardial wall, due to the change in myofibers geometry from a right-handed helix in the subendocardium to a left -handed helix in the subepicardium, there is a twisting motion induced by the opposite rotations of LV apex and base. When both layers contract simultaneously, a larger radius of rotation for the outer epicardial layer induces mechanical predominance of the epicardial fibers in the overall direction of rotation 27. Physiological variables such as preload, afterload, and contractility impact LV twist: twist increases with preload and decreases with afterload. The effect of preload on twist is about two-thirds as great as that of afterload 28. In our patients with chronic AR we found a reduced peak LV apical rotation and a decreased and delayed peak LV systolic twist and torsion, suggesting a complex effect of the interaction between preload, afterload and subtle LV systolic dysfunction on LV torsional mechanics in this setting. Conversely, peak LV basal rotation was similar in healthy subjects and in AR patients in our study. In a recent 12 study, LV rotation and torsion were assessed in patients with moderate and severe AR and the results showed that patients with moderate AR and without arterial hypertension had increased LV apical rotation, while LV torsion was lower in the severe AR group compared with moderate AR group, but there was no difference in the apical rotation compared with moderate AR and control patients. In severe AR group, LV dimensions were higher than in moderate AR patients, indicating progressive LV remodelling and sphericity with no further increase in apical rotation12. In our study, peak LV apical rotation and peak LV torsion did not significantly decrease during short-term follow-up, as opposed to LV GLS, suggesting possibly a slower progression of subepicardial dysfunction compared to subendocardial dysfunction in patients with significant chronic AR. Among baseline parameters of LV function and geometry significantly correlated with the progressive decrease in LV GLS, baseline peak LV apical rotation, together with baseline LV GLS emerged as independent determinants of end of follow-up LV GLS. Left ventricular diastolic dysfunction is a frequent feature in chronic AR patients that may persist or even progress after AVR29. In our study population, parameters of diastolic LV function such as E wave and TDI derived septal e’ were decreased and E wave deceleration time (EDT), LA volume index, and LV filling pressures estimated by E/E’ ratio were increased in AR patients compared with healthy subjects. A newer STE-derived parameter of LV diastolic function is LV untwisting. Systolic LV twist is followed by rapid LV untwisting in early diastole. Rapid diastolic untwisting induces an early diastolic intraventricular pressure gradient that contributes to diastolic suction 30. A decreased untwisting leads to impaired LV filling, LV end-diastolic volume, and stroke volume 31. Increased preload is known to delay and slow untwisting in the absence of contractility abnormalities 32. In the present study, peak LV untwisting velocity was decreased in AR patients at baseline and tended to significantly decrease during short-term follow-up. These findings from our study suggest that diastolic parameters are more sensitive markers of LV dysfunction in chronic AR progression, reflecting changes in myocardial structure (fibrosis) 33. Optimal timing for surgery in asymptomatic patients with chronic AR is still a challenge for the clinician due to the fact that these patients may display a normal LVEF for many years, yet many of them develop irreversible myocardial dysfunction inducing an increased risk for unfavorable post-operative outcomes. Therefore, identifying parameters of early LV dysfunction, before LVEF declines, may have a key role in closer monitoring and even early surgery in these patients. In asymptomatic patients with significant AR and normal LVEF, noninvasive parameters of LV intrinsic contractility, such as LV global longitudinal strain, LV apical rotation and torsion, assessed by speckle-tracking echocardiography, are impaired, thus detecting early subclinical LV dysfunction before LVEF declines. During short-term follow-up, LV global longitudinal strain further decreases despite preserved LV geometry and LVEF. These findings suggest a potential role of these parameters in closer monitoring for asymptomatic AR patients. 1. Dujardin KS, Enriquez-Sarano M, Schaff HV, et al. Mortality and morbidity of aortic regurgitation in clinical practice. A long-term follow-up study. Circulation1999;99:1851–7. 2. Bonow RO, Picone AL, McIntosh CL, et al. Survival and functional results aft er valve replacement for aortic regurgitation from 1976 to 1983: impact of preoperative left ventricular function. Circulation 1985;72:1244–56. infl uence of duration of preoperative left ventricular dysfunction. Circulation 1984;70:570 –9. 4. Chaliki HP, Mohty D, Avierinos JF, et al. Outcomes after aortic valve replacement in patients with severe aortic regurgitation and markedly reduced left ventricular function. Circulation 2002;106:2687–93. 5. Vahanian A, Alfi eri O, Andreotti F, et al. Guidelines on the management of valvular heart diseases (version 2012). Eur Heart J 2012; 33:2451-96. 6. Olsen NT, Sogaard P, Larsson HB, et al. Speckle-tracking echocardiography for predicting outcome in chronic aortic regurgitation during conservative management and aft er surgery. JACC Cardiovasc Imaging 2011;4:223-30. 7. Onishi T, Kawai H, Tatsumi K, et al. Preoperative systolic strain rate predicts postoperative left ventricular dysfunction in patients with chronic aortic regurgitation. Circ Cardiovasc Imaging 2010;3:134–41. 8. Vinereanu D, Ionescu AA, FraserAG. Assessment of left ventricular long axis contraction can detect early myocardial dysfunction in asymptomatic patients with severe aortic regurgitation. Heart 2001; 85:30–6. 9. Marciniak A, Sutherland GR, Marciniak M, et al. Myocardial deformation abnormalities in patients with aortic regurgitation: a strain rate imaging study. Eur J Echocardiogr 2009;10:112–9. 10. Mizariene V, Grybauskiene R, Vaskelyte J, et al. Strain value in the assessment of left ventricular function and prediction of heart failure markers in aortic regurgitation. Echocardiography 2011;28:983-92. 11. Smedsrud MK, Pettersen E, Gjesdal O, et al. Detection of left ventricular dysfunction by global longitudinal systolic strain in patients with chronic aortic regurgitation. J Am Soc Echocardiogr 2011;24:1253-9. 12. Mizariene V, Bucyte S, Zaliaduonyte-Peksiene D, et al. Left ventricular mechanics in asymptomatic normotensive and hypertensive patients with aortic regurgitation. J Am Soc Echocardiogr 2011;24:385-91. 13. Kusunose K, Agarwal S, Marwick TH, et al. Decision making in asymptomatic aortic regurgitation in the era of guidelines: incremental values of resting and exercise cardiac dysfunction. Circ Cardiovasc Imaging 2014;7:352–62. 14. Ewe SH, Haeck ML, Ng AC, et al. Detection of subtle left ventricular systolic dysfunction in patients with signifi cant aortic regurgitation and preserved left ventricular ejection fraction: speckle tracking echocardiographic analysis. Eur Heart J Cardiovasc Imaging 2015 Mar 1 [Epub ahead of print]. 15. Kim WJ, Lee BH, Kim YJ, et al. Apical rotation assessed by speckle-tracking echocardiography as an index of global left ventricular contractility. Circ Cardiovasc Imaging 2009;2:123-31. 16. Lancellotti P, Tribouilloy C, Hagendorff A, et al. Recommendations for the echocardiographic assessment of native valvular regurgitation: an executive summary from the European Association of Cardiovascular Imaging. European Heart Journal – Cardiovascular Imaging 2013;14:611–44. 17. Devereux RB, Alonso DR, Lutas EM, et al. 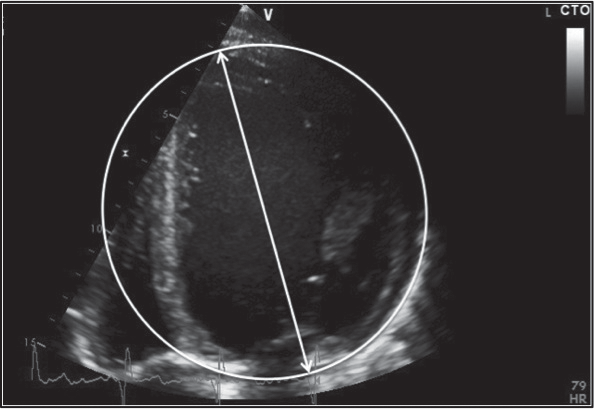 Echocardiographic assessment of left ventricular hypertrophy: comparison to necropsy findings. Am J Cardiol 1986;57:450-8. 18. Lang RM, Bierig M, Devereux RB, et al. Recommendations for Chamber Quantifi cation: A Report from the American Society of Echocardiography’s Guidelines and Standards Committee and the Chamber Quantifi cation Writing Group, Developed in Conjunction with the European Association of Echocardiography, a Branch of the European Society of Cardiology. J Am Soc Echocardiogr 2005; 18:1440-63. 19. Mannaerts HF, van der Heide JA, Kamp O, et al. Early identifi cation of left ventricular remodelling aft er myocardial infarction, assessed by transthoracic 3D echocardiography. Eur Heart J 2004;25:680-7. 20. Ommen SR, Nishimura RA, Appleton CP, et al. Clinical utility of Doppler echocardiography and tissue Doppler imaging in the estimation of left ventricular fi lling pressures: a comparative simultaneous Doppler-catheterization study. Circulation 2000;102:1788–94. 21. Mor-Avi V, Lang RM, Badano LP, et al. Current and evolving Echocardiographic Techniques for the Quantitative Evaluation of Cardiac Mechanics: ASE/EAE Consensus Statement on Methodology and Indications. Endorsed by the Japanese Society of Echocardiography. J Am Soc Echocardiogr 2011;24:277-313. 22. van Dalen BM, Vletter WB, Soliman OI, et al. Importance of transducer position in the assessment of apical rotation by speckle tracking echocardiography. J Am Soc Echocardiogr 2008;21:895–8. 23. Bekeredjian R, Grayburn PA. Valvular heart disease: aortic regurgitation. Circulation 2005;112:125–134. 24. Carabello BA. Aortic regurgitation. A lesion with similarities to both aortic stenosis and mitral regurgitation. Circulation 1990;82:1051–3. 25. Ricci DR. Aft erload mismatch and preload reserve in chronic aortic regurgitation. Circulation 1982;66:826–34. 26. Di Salvo G, Rea A, Mormile A, et al. Usefulness of bidimensional strain imaging for predicting outcome in asymptomatic patients aged<16 years with isolated moderate to severe aortic regurgitation. Am J Cardiol 2012;110:1051-55.
function in aortic valve stenosis and aortic regurgitation. J Am CollCardiol 2002;40:2182-8. 30. Notomi Y, Martin-Miklovic MG, Oryszak SJ, et al. Enhanced ventricular untwisting during exercise: a mechanistic manifestation of elastic recoil described by Doppler tissue imaging. Circulation 2006; 113:2524-33. 31. Beladan CC, Calin A, Rosca M, et al. Left ventricular twist dynamics: principles and applications. Heart 2013;100:731-40. 32. Moon MR, Ingels NB Jr, Daughters GT 2nd, et al. Alterations in left ventricular twist mechanics with inotropic stimulation and volume loading in human subjects. Circulation 1994;89:142-50. 33. Liu SK, Magid NR, Fox PR, et al. Fibrosis, myocyte degeneration and heart failure in chronic experimental aortic regurgitation. Cardiology 1998;90:101-9.